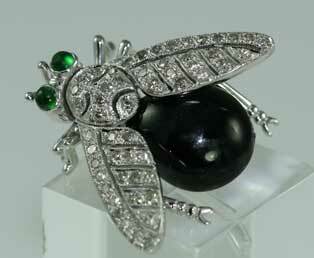 This small, incredible black onyx brooch features a fly design. 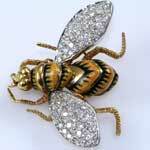 This antique insect brooch will make a great addition to your collection. This handmade fly pin has clear, deep green emerald cabochon eyes that sparkle against a shiny, black onyx cabochon body. Movable legs and wings bring realism to this unique insect pin. Watch this small pin fly as movement dictates. A hidden face is barely noticeable amongst the diamonds on the fly's back. 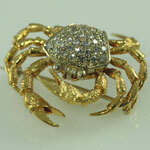 This estate jewelry pin would be spectacular on a shirt collar or jacket. Made in 18kt white gold. This small pin measures 7/8 inch x 1 1/4 inch.